Dying to find out the latest on “The Real Housewives of New Jersey”? Wondering what all the fuss is about Sandra Bullock’s hubby, Jesse James? Forget about wading through Goggle or WordPress for the most up-to-date info – sign up for my Facebook page! On Facebook, you’ll know immediately when I’ve written another post – plus you’ll have access to TV/celeb snippets that I don’t write about on this blog. You’ll also be able to join in the conversation with other fans of your favorite shows. It’s real easy – all you need is a Facebook account (and really, who doesn’t have one of those these days?). 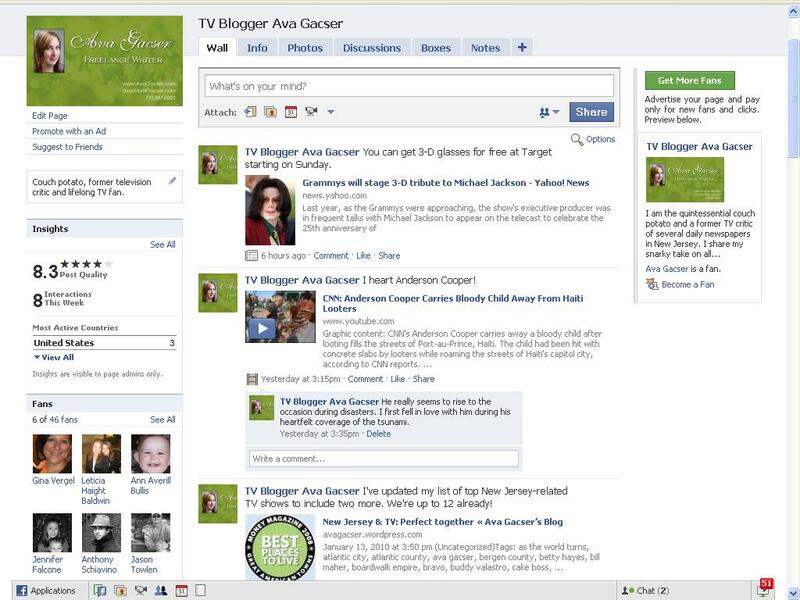 Simply click on this link or search for TV Blogger Ava Gacser on Facebook and click on “Become a Fan.” It’s that simple! So don’t hesitate – join today. I’m looking forward to getting to know you and I’m curious about what you’re watching!